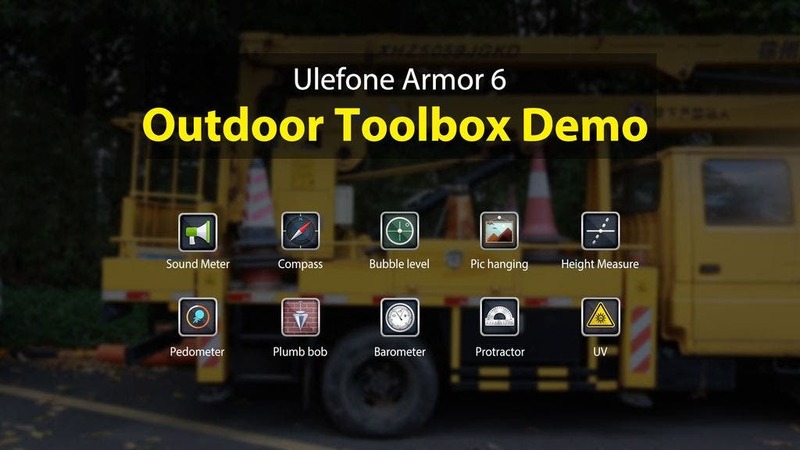 The new rugged Ulefone Armor 6 is an ideal phone for the outdoor usage and in today’s video the makers will try to argue this point fully showing the potential of its outdoor toolbox. So check it out to find out more about the individual features like the compass, barometer, heightmeasure, gradienter, plumb bob, pedometer, protractor, soundmeter, magnifier or UV detector. Phew that’s a big load of words so really better to see the video for a better idea. Ulefone Armor 6 equips Helio P60 AI processor and 6GB RAM plus 128GB internal storage. The phone comes with 6.2 inch notch screen, equips 21MP+13MP dual rear camera and 13MP front camera, packs 5000 mAh big battery and supports wireless charge, supports fingerprint ID and face unlock, supports global frequency bands and NFC, Google Pay, and Android 8.1 as the OS. Of course we also have to mention the IP68/IP69K certifications and MIL-STD-810G protection grade, because the ruggedness of the phone is of course the main selling point. There will be also a special sales event tied to the 3.28 Aliexpress promo event, where you will be able to grab one of the 500 pieces of Ulefone Armor 6 just for $299.99. But don’t worry, even other models from the Armor and Power phone families will get some discount love. So keep in touch with the official Ulefone website to know everything important.